CNN.com reports that Republican supporters of Senator John McCain are starting to exhibit rageful characteristics at recent rallies on the campaign trail. 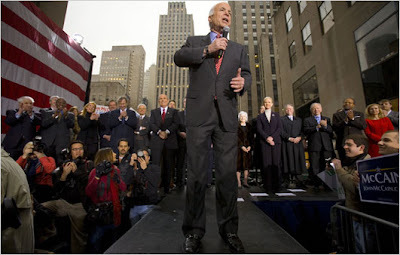 With the news of Obama taking the lead in national polls, McCain hopefuls are begining to act out in support of their candidate. "When you have an Obama, [House Speaker Nancy] Pelosi and the rest of the hooligans up there going to run this country, we have got to have our head examined. It's time that you two are representing us, and we are mad. So, go get them," one man told Sen. John McCain at a town hall meeting in Waukesha, Wisconsin. Another man was more pointed. "And we're all wondering why that Obama is where he's at, how he got here. I mean, everybody in this room is stunned that we're in this position," another man said at a rally. "I'm mad. I'm really mad. And what's going to surprise you, it's not the economy. It's the socialists taking over our country," one said. Later in Minnesota, a woman told McCain: "I don't trust Obama. I have read about him and he's an Arab." It is sad when people would rather deal in ignorance than in truth. As an Obama supporter, it is my duty to learn as much as I can about McCain and his "fundamental" differences from my candidate. In doing so I am able to make honest and forthright declarations about my stance on the issues of this elections. It is disturbing to hear McCain supporters spew so many non-truths, when there are core issues at the heart of this election. With less than a month to election day, to still hear McCain supporters referring to Barack as "that Obama" and "an Arab", it just shows the true disconnect that we have in this Country. Wake Up People! Change Has Come!